Austrian Peace Note published; Concurrently Germany makes a definite offer to Belgium; Belgium to revert to her neutrality, the old commercial treaties to be maintained, the “Flemish” question to be dealt with, no indemnities and no reparation. German retreat between the Meuse and Moselle continues on a front of 33 miles from Bezonvaux, north-east of Verdun, to Norroy, north of Pont-à-Mousson; fortress guns of Metz in action. Further French advance east of Vauxaillon; they take Mt. des Singes with 1,300 prisoners, and farther south, Vailly. French and Serbian offensive, under Franchet d’Esperay and Marshal Misitch, in the Balkans. German offensive against the Lublin–Cholm railway stayed at Krasnik. German attacks in the Arras region “stifled at birth” by the French artillery; slight German progress in the La Haye district between the Meuse and Moselle. British force from Aden, which had fallen back on Lahej before a Turkish force from the Yemen, attacked and retires to Aden. The German cruiser Königsberg, which had sheltered in October up the Rufigi River in German East Africa, destroyed by the monitors Severn and Mersey. Determined attack by the Turks in Gallipoli repulsed with heavy loss. From Petrograd comes news of a notable Russian success in the Carpathians. In the centre of this zone of fighting the Russians were able to advance to the southern side of the Rostoki Pass. 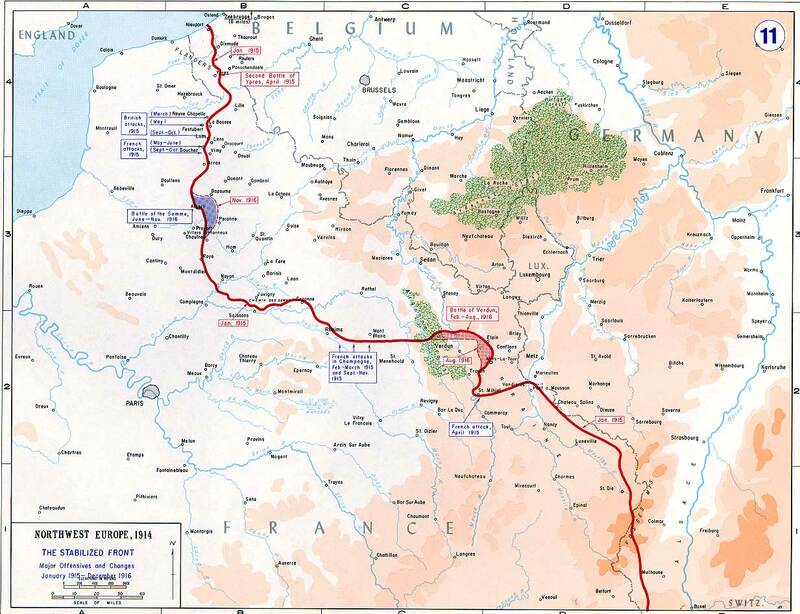 German line between the Meuse and the Moselle pushed back by the French. The 151st day of the war. Flight Commander Hewlett lands at Ymuiden, having been picked up by a Dutch trawler after the raid on Cuxhaven. Full text of the United States Government Note to Great Britain published. The French advance, especially between the Meuse and the Moselle. The King’s Australian Forces take Bougainville, the largest of the Solomon Islands. New decoration, the Military Cross, instituted. The National Relief Fund exceeds 4½ millions sterling. The Times Sick and Wounded Fund, £802,268. The Queen’s “Work for Women” Fund, £119, 289.